My search for photos and stories of fans who met the Beatles in person led me to this wonderful little story of two teenage fans who knocked on John's door at Kenwood and met him. The description of what John is wearing totally fit into the photos which have been somewhat of a mystery to fans.... Do you think they were taken by the girls in this story?? We made up our minds. Two teenage girls, one 16 one 17 truly on a mission. This time would be it. This time we wouldn't leave without meeting John. And this time, we walked boldly up the long and winding drive to the door. I knocked. We expected nothing. I knocked again - and the door slowly opened. A lady politely asked what we wanted. Pretty obvious really, but I made up something about us being representatives of a student's union newspaper and would like to give our readers the biggest surprise of their lives. The lady told us to wait and returned after what seemed an endless wait to say: "Yes, John will be pleased to see you, could you come back in about an hour?" I spluttered a thank you, and we floated off down the drive. Out of site of the house, we started blabbering the most incredible rubbish at each other, what would we say, can it be true, don't faint. But in that hour, we managed to contain ourselves by saying that it was probably not going to happen, so when we returned, and were asked into the house, we were a little calmer. We were taken through to a room which opened on to a big terrace with a pool, and there, sitting cross-legged on a sofa, was John. Wearing a black and white striped T-shirt and purple velvet trousers, he greeted us with: "Come in, sit down, sit anywhere." The room was decorated with strange pictures and wall hangings, and in one corner was the famous white piano. We explained how hard we had tried to meet him, and he said: "There you see, you only had to knock on me door!" We couldn't take our eyes off of him, and I struggled to speak at first, but after a while he began to ask about us. What were our ambitions, which Beatles songs were our favourites, where were we from. We talked about everything from the state of the world to music and fashion. At one point, John tried to phone Paul McCartney to set up a meeting with him, but unfortunately he wasn't there to answer. Norma mentioned that I played the piano, and John tried hard to get me to play. I just couldn't with my shaky fingers, but managed to plink a few notes on the famous piano. He asked if we'd like to use the swimming pool, then we all laughed when we noticed there was no water in it. John said it was so refreshing to meet us: "real people not the crazy ones I usually get to hang out with." We shared tea with him and must have been chatting for about 2 hours, when the housekeeper arrived (she had been in and out keeping an eye on us) and said we should go, as John was tired. "No, I'm not", he protested. But I felt it was right to leave then. As we said goodbye, he told us we should come back again, any time. Every time we hear those words, my friend and I wonder and wonder why we didn't. That will remain a mystery forever. When John died, our grief was tempered with that beautiful memory. And we both went on to fulfill the ambitions that we had told John about. I became a music journalist, and Norma developed artistic craft work. I'm sure he would have been proud of the two girls who achieved the ultimate ambition on that day in July 1967. Interesting stuff! It could be the same visit that produced those photos (though they don't mention Simon and Marijke). Lizzie would know, as she is friends with the photographer. i have to ask judy about that day. 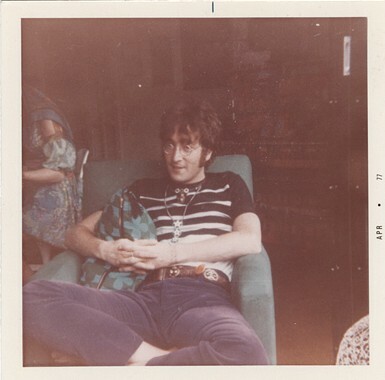 I am sure that shirt and trousers were common for John to wear in the summer of 1967, but it is still neat for me to think that those photos and that story go together. Amazing! John was a far sweeter man than the generalization people put him in. I love this story! I am confused - the photos are dated, 1971; yet, the story takes place in 1967. Also, am I mistaken, or is that George seated with John in the background, sporting the blue slacks and yellow boots? Who is the woman seated behind John? I know about the homeless guy in the film, "Imagine," that John invited in for breakfast, so John was cool and emathetic; but, there is something too conveniently simple about this story that does not add up. John happenes to be home and invites two "interlopers' into his home he has never met. Would you do this - even back in the 60s? Perhaps. Wasn't his entrance gate closed and locked. He assume he did not leave it open - did he? I would love to believe it is a true account. Did I miss something? Who and where are these 'girls' today? Where did they come from. Were they Americans? How did a 16 and 17 year old get there? This would make a great made-for-TV mini-movie. Does Tinseltown make such movies anymore? Seems like all manufacture are cookie-cover doctor - lawyer - cop shows with boring reality TV thrown in. Ah! it isn't like back in the day when everything was so cool and fun! hi jeff. the photos were taken by my friend judy from new york (who now lives in florida). the date on the instamatic photos is not from when they were taken, but when they were PRINTED. i have many like that. john's gate was never locked. i went to his house many times and walked right up to the front door. and yes, he would come out to talk to us, pose for photos and sign autographs. this story seems quite possible to me. the people with john in that photo are from "the fool". they were painting his piano at the time. they made many clothes for the beatles, painted the outside of apple (it was BEAUTIFUL) and also had a lot to do with the shop itself. 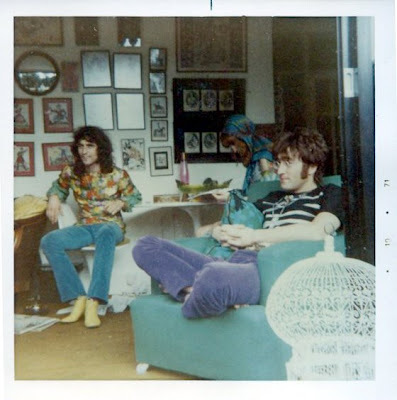 i was 15 in 1967 and i went to london with my friend denise, also 15. we came from rio de janeiro, brazil. there were many american girls our age who went there on their school holidays just to see the beatles. there were girls from other countries too. i'm still in touch with many of them. Do you have a Twitter account? I love this site! !